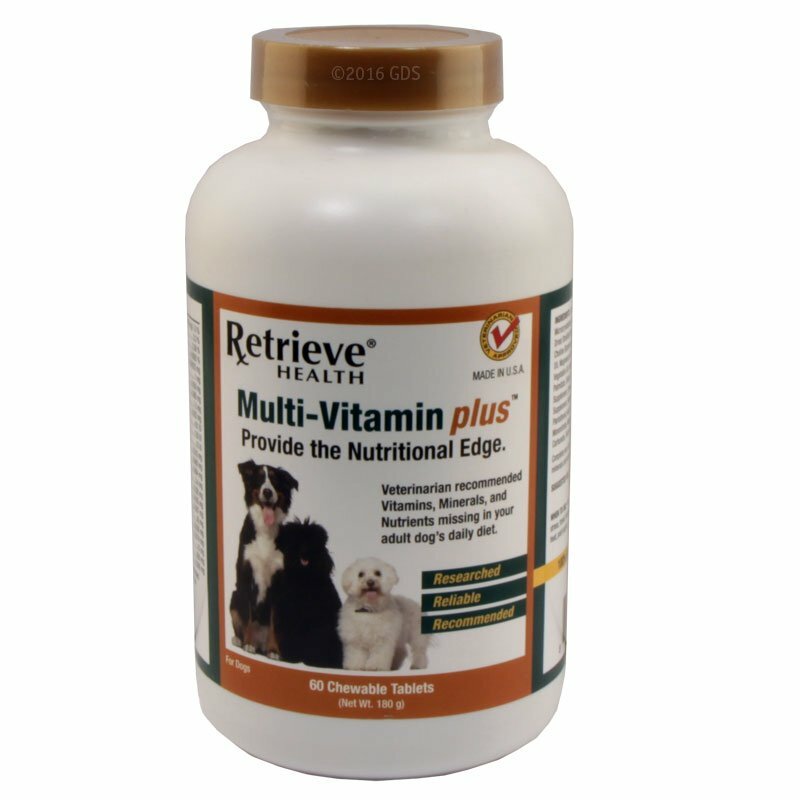 Adult Dog Multi-Vitamin Plus by Retrieve Health. $15.95. 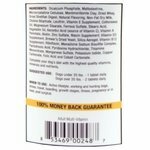 "We have been giving these vitamins for years"
We have been giving these vitamins for years. First time using these. Dogs love them and helps keep them strong after days in the field. Veterinarian recommended and scientifically formulated Retrieve Health MULTI-VITAMIN PLUS supplies the highest quality of essential vitamins, minerals and nutrients needed for a proper daily diet. 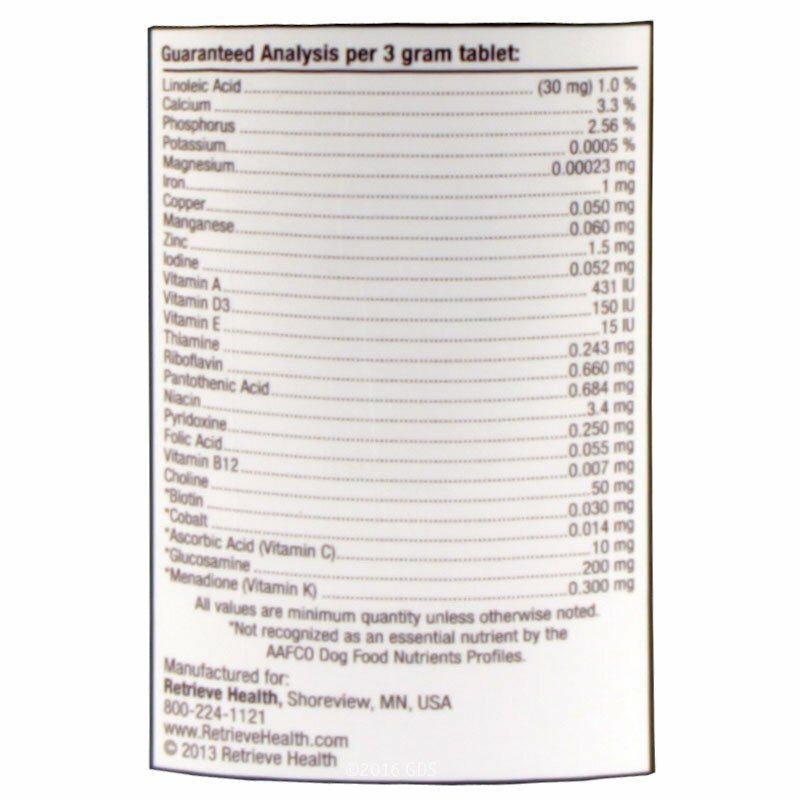 These vitamins and minerals feature bonded vitamins and chelated minerals giving your dog optimal utilization, with time released properties and optimal benefits. 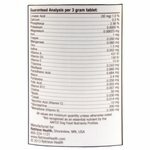 Maltodextrins, Dicalcium Phosphate, Montmorillonite Clay, Microcrystalline Cellulose, Natural Flavoring, Dried Shellfish Diegest, Whey, Non-fat Dry Milk, Brewerï¿½s Yeast, Lecithin, Ferrous Sulfate, Niacin, Processed Grain By-Products, Magnesium Stearate, Stearic Acid, Calcium Ascorbate (source of Vitamin C), Vitamin E Supplement, Biotin, Zinc Sulfate, d-Pantothenic Acid, Vitamin A Acetate, Silica Aerogel, Riboflavin, Thiamine Mononitrate, Vitamin D3 (Cholecalciferol), Manganese Sulfate, Vitamin K, Pyridoxine HCI, Folic Acid, Copper Carbonate, Potassium Iodide, Cobalt Carbonate and Cyanocobalamin. 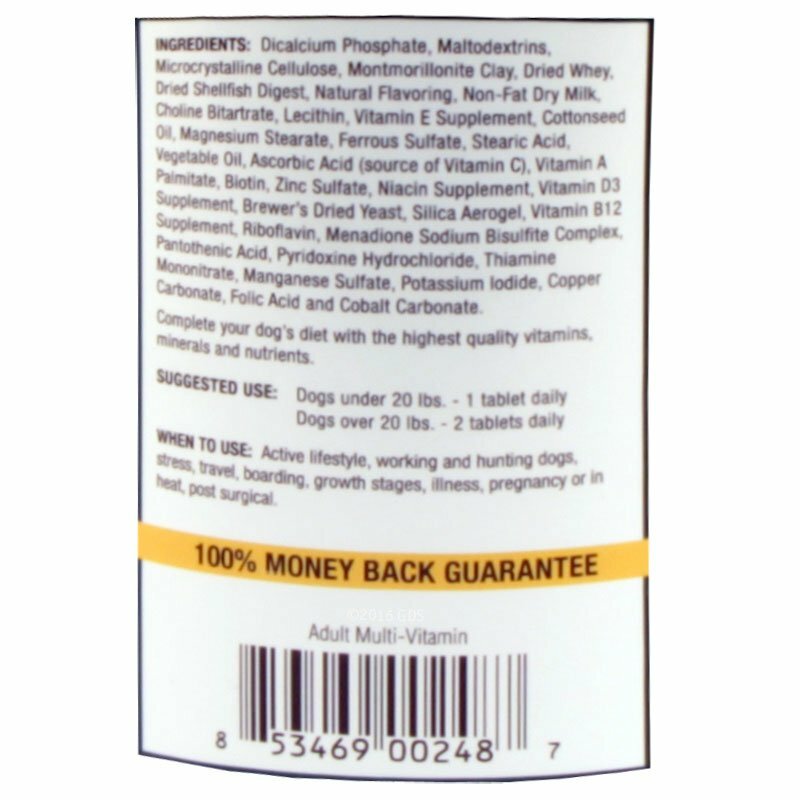 Active lifestyle, working and hunting dogs, stress, travel, boarding, growth stages, illness, pregnancy or in heat, post-surgical.